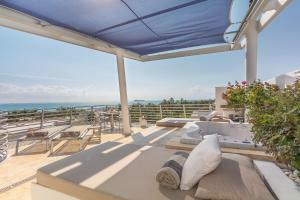 Villa Paradiso offers accommodations just a 4 mintues' walk from the shimmering shores of Miami Beach. Guests can relax on the furnished outdoor garden patio. Complimentary WiFi is available for all guests. Rooms feature a full kitchen great for making a meal. A dining area with dining table is also provided. Flat-screen TVs are offered in all room types. Select rooms feature a balcony. Daily housekeeping is provided. Lummus Park is a 4 minutes walk from Villa Paradiso. The nearest airport is Miami International Airport is 21.6 km from the hotel. When would you like to stay at Villa Paradiso ? This spacious room features a kitchenette, refrigerator, and dining area. The room also has a flat-screen TV, free coffee, and a safety deposit box. The private bathroom is fitted with free toiletries and beach amenities. This studio features a balcony, dining area and air conditioning. Each day we'll check prices and send you an email for your selected dates at Villa Paradiso. If you don't have specific dates but would like to check prices for say next weekend or say next month we can check the price too. Click to write a review and share your experience of Villa Paradiso with other travellers.